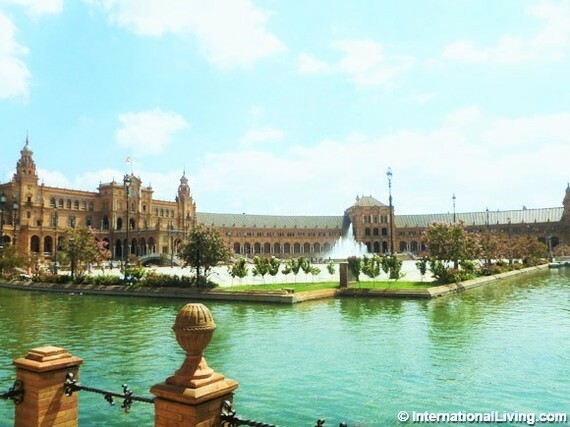 Lying at the heart of sunny Andalucía, Seville is one of southern Spain's most beautiful cities. Waves of conquerors, from the Romans to the Moors, have left their stamp on its spectacular architecture. Thousands of tapas bars line the streets, and the warm Spanish sun nurtures parks full of palm trees. With such beauty all around, it's easy to see what drew Ohioans Karen and Rich McCann to Seville, where they now enjoy fine dining, a great social scene, and terriﬁc, inexpensive healthcare. In 2004 Karen, now 63, and Rich, 71, embarked on a year-long adventure in southern Spain. The newly retired couple had always loved the idea of living overseas, so they decided to try it for a year, making a home for themselves in sunny Seville. "I always wanted to live abroad," says Karen. "In fact, we talked about it on our first date. Rich was in the naval reserves, had traveled in Asia, and was talking about Singapore, and I thought, 'Okay, as long as it's abroad!'" Eventually, the couple was asked to join friends for a vacation in southern Spain -- an offer they couldn't refuse. And they fell immediately in love with the place. "We got here, and it was like, 'Oh my God, we really like this'," says Karen. "It's so much like California -- the weather, the Spanish speakers, the palm trees. We were comfortable with the whole atmosphere. "We kept our place in Ohio and told people we were going for a year ... but six months in, we looked at each other and said, 'We don't want to go back'." So the couple sold their large Ohio home, cleared out 20 years' worth of possessions, and planted themselves permanently on Spanish soil. They renewed their year-long visas for a second year, then a third, and eventually got permanent residence cards that they only have to renew every five years. Seville is the capital of the Andalusian region and the fourth-largest city in Spain. It's known for its mild winter weather (temperatures never drop to freezing, while summers rarely dip below the mid-80s F), large old town with three UNESCO World Heritage Sites, and flamenco music. 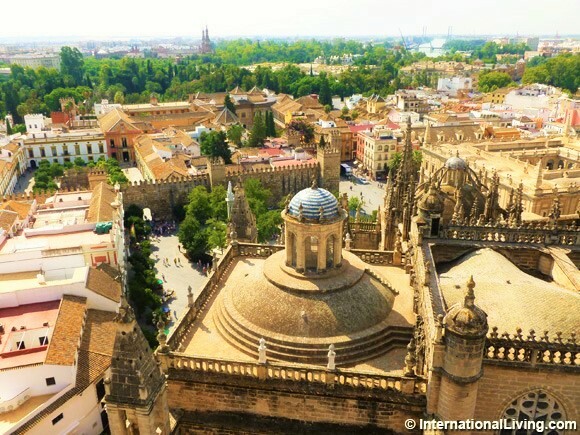 The architecture shows the accumulation of cultures that make up Andalusian Spain; palaces, towers, spires, columns, and intricate church facades abound, as do sprawling plazas and charming, maze-like alleys full of shops and restaurants. "I think the first thing that struck me was the vibrancy of street life here. "Everybody dines out. Tapas, drinks ... there are allegedly 3,000 little bars in the city. People here take their social lives as seriously as Americans take their business lives. They have a strong understanding that family, friends, and personal life are important and meant to be front and center. "Seville has an amazing food scene. It has changed a lot just in the 10 years we've been living here. There's still a lot of classic fare, usually cooked by somebody's grandmother out back in the kitchen. But some trendier places have sprung up lately, along with food tours and cooking classes. The trendy new spots are serving traditional dishes with a twist, such as carriadas (stewed pig cheeks) with an added, fancy dollop of cream sauce and a sprig of parsley. They're creating Spanish fusion dishes, such as bull-meat burrito or grilled tuna steak with chocolate (mole) sauce. And foreign dishes such as pad Thai, spring rolls, and guacamole are appearing on menus. It's an exciting time to be eating in Seville. "Costs vary widely, but typically we spend under $30 per person for a good meal with wine. A lot of the bars have super-cheap beer. The cheapest in town is just 40 céntimos (about 45 cents) and the average is about $2 for a beer and $2 for a tapa. You don't have to spend a lot to enjoy the street life; we had friends come visit us from San Francisco, and every time the bill came they burst out laughing. For six of us to eat out was the cost of two glasses of wine in San Francisco." Beer and tapas aren't the only things that are affordable in southern Spain, according to Karen. Housing -- particularly for renters -- is a good deal. And the overall cost of living is comparable or less than their costs in the States. "Overall," Karen says, "our cost of living is about the same as Cleveland. We spend more on travel and a lot less on food, going out, and entertainment. We don't have a car here, so we save on that, because in Seville we can walk everywhere ... And our rental is a fabulous deal. We pay far less than we'd pay in any city in the U.S.
"My Spanish friends pay about €500 or €600 ($530 to $636) a month for modest places on the outskirts. The normal cost is €800 to €1,000 a month ($848 to $1,006) in a more central location, but that depends on things like balconies and garages. This is for a one- or two-bedroom." She says, "When I first moved, my doctor in the States told me my cholesterol was high. I wanted a second opinion, so I went to a private clinic here in Seville. It was only a five-minute wait. The doctor took my records himself ... And then told me my cholesterol is a little high, but we can make a few dietary changes ... basically, drink more red wine, eat more dark chocolate." Every interaction with the Spanish healthcare system in their 11 years in Seville has been overwhelmingly positive. "I love that the doctors here make house calls," says Karen. "One time I got bronchitis. I was in bed for days. They said, 'We'll have a doctor out to you in two hours.' And two hours (to the minute), the doorbell rang. He was great. He prescribed some meds, Rich ran to the pharmacy across the street to get them, and I was better in two days. To have someone come to you like that when you're ill is an enormous luxury." 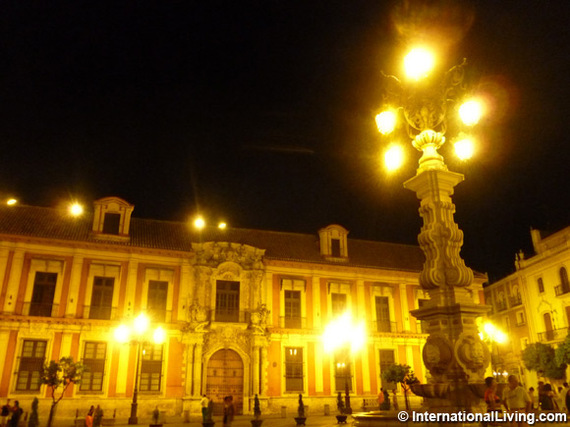 The couple also loves Seville's relaxed pace of life. An average day includes time for writing, photography, morning yoga or Pilates classes, siestas, shopping, meeting friends for coffee, tapas in the plaza near their house, and exploring Seville's charming neighborhoods with notepad and camera in hand. Karen's love for southern Spain and living abroad runs so deep that she has continued blogging (enjoylivingabroad.com) and writing books on the subject even into retirement. 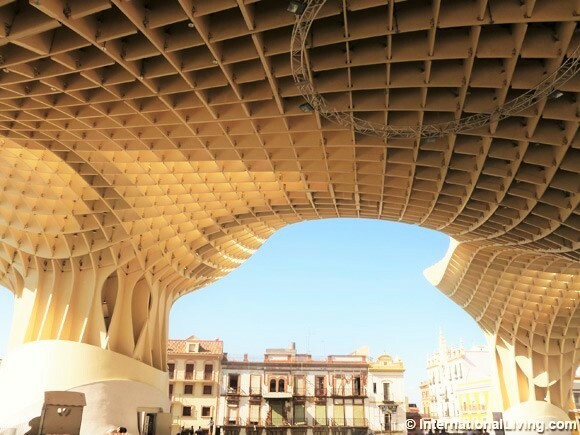 "Seville is a very old city," she says. "I pick a neighborhood, photograph it, pop into shops, meet people, chat with everyone ... it's an interesting way to spend my time. In the winter, I go in the afternoons; in the summer, the mornings." Karen and her husband are also learning more Spanish. She says, "We started taking courses after that first vacation. And here's something I'd recommend: private lessons. Sitting with 20-year-olds who speak three languages and are at their peak ... well, my learning capacity is different. We stuck it out because we liked the social interaction." Looking back, Karen says the move has changed her in a profound way, and worked wonders for the couple's retirement. "Moving here has revitalized my life in a way I didn't expect. I thought it would be fun and interesting and stimulating ... but I didn't think it would transform me. Yet I feel like a new person. Moving abroad is the best way to reinvent yourself ... you get to become the 'you' you want to be at this stage of life."